If you read that book (as I strongly suggest to do) you will easily understand that there are three different levels of comprehension of the text. The first is about the definition of various types of military strategies, the second is about to use that strategies in other areas of conflict excluding warfare, the third is about a cultural lesson – understand a different approach to problems that derivates straight from Taoism. Every level is useful, no matter how many years passed since the Sun-Tzu age. Even with all the differences given from the development of technologies and from a whole different set of cultural meanings the sharp thoughts of long-time dead general are still with us. These few pages are a must, something to keep with you for a long time. There’s no need at all to know about China in the 6th century B.C. 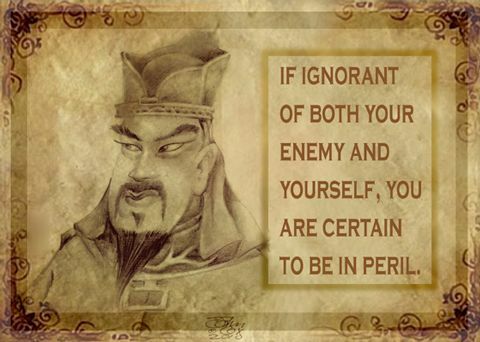 or about the personal life of Sun Tzu; his lessons are what you need to be on the edge. It is basic wisdom, highly valuable precisely because representing a basis, it can be read in different levels, as you said. It is somewhat comparable to our own Machiavelli, whose writings I have always appreciated; he is often superficially labeled as “cynical opportunist”, but from my point of view it is just pragmatism. OMG, what tales from the past! 🙂 Machiavelli is basic in my personal formation as a full-time pragmatic. In my little pantheon he’s in good company; Musashi [Go Rin No Sho], Sun-Tzu for the aforementioned book, Garibaldi [for his autobiography]. I’ve to write about them sooner or later, they’re too good to be left in the shadows. And let’s not forget Richelieu and Bismarck! I’ve got both of them in my crosshairs, do not worry. Of course I cannot forget Tocqeville and Mazzini, Payne and Cromwell. Well, it’s a pantheon after all.